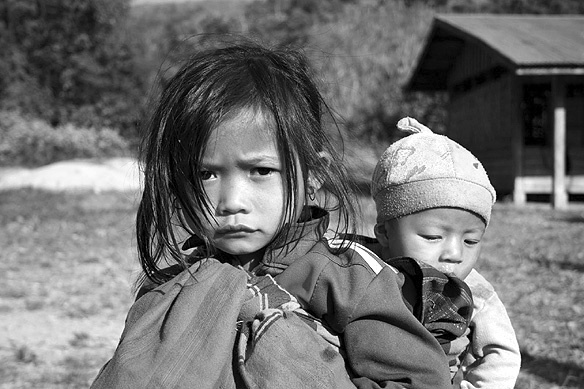 Laos was then ranked 135 out of 177 countries in the 2004 Human Development Report and the most underdeveloped country in the Mekong region, ranking even lower than Cambodia and Vietnam. We bought stationery, posters and footballs to give to the children in the primary schools along the rural roads. Most of these schools receive no funding from government or otherwise and are community based projects. It was a touching experience, seeing the children lined up outside their shack like classroom, barefoot and dirty, beaming from ear to ear at their newly acquired pencils and notebooks. Incredibly hungry to learn and exceedingly grateful for being given a chance. This entry was posted in Global Travel Shot and tagged Laos, People Photography, Vang Vieng by Rama Arya. Bookmark the permalink. Thank you Bagchi. I do have the following statement: “© All content—text and photos (unless otherwise specified)—on this blog are copyrighted by Rama Arya and may not be used without explicit permission.” on my blog. But perhaps a copyright symbol on the images is also a good idea.